While there are many options available, the most durable choice for home fences and gates is vinyl fencing. Vinyl fencing and gates can be installed for a multitude of reasons. From security to decoration and no matter what type of property they’re being installed on, you want the fencing to look good and last for a very long time. The three main types of vinyl fencing are privacy, picket and ranch rail. Privacy fences are six feet high. They can be solid the entire six feet but often have lattice or another design for the top of the fence. 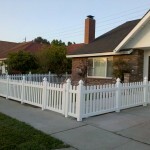 Picket fences are generally three to four feet high and are available in a variety of styles. The pickets can be all the same length giving a uniform look, or they can be arched. Ranch rail fencing is an open design wherein simple rails run in between to posts, much like what you would see on a ranch or farm. A vinyl fence offers the traditional look of a wood fence without the maintenance. It is virtually maintenance free while still looking great. Along with the vinyl fence, you have a choice of gates and arbors that can be added to change the entry to your yard completely. Arbors can be squared at the top or have a rounded arch to soften the look. When considering different types of fencing, be sure not to overlook the vinyl fence option. You will appreciate its durability and resemblance to more traditional wooden fences more than you might realize. It is also available in a variety of colors to fit into any landscaping you already have or fit into any vision you may have for your yard. This entry was posted in Home Design Ideas and tagged gate fencing, home fencing, Home Improvement, picket fencing, privacy fencing. Bookmark the permalink.